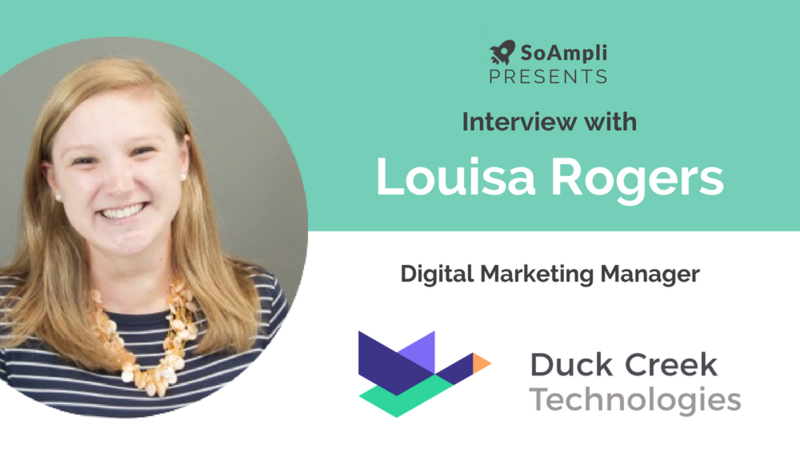 In the first instalment of our Spotlight On: SoAmpli Clients series, our senior customer success manager Charlotte Smith sat down with Louisa Rogers, Digital Marketing Manager at Duck Creek Technologies to speak about how they kicked off their social selling programme and the results they’ve seen so far. Charlotte: What do you see as the benefits of activating your team on social media/social selling via SoAmpli? I always go back to the phrase, SoAmpli is so stupid simple. When I show people SoAmpli, they say, “oh you just hit share?” and I say, “yes it’s that simple”. Louisa: The biggest benefit of SoAmpli for me is the amazing onboarding, customer support and training materials that they offer. The email communication templates, detailing the benefits of SoAmpli and how to sign up, were hugely helpful. Whilst I was importing content and setting up the platform, the internal email communication about the platform and its benefits were handled. It was also so awesome to have Maz fly to Boston for our big sales event to kick things off. One piece of advice Edwin, our VP of sales, gave me that paid off is, once you generate momentum from the sales kick off, people are going to want to get their hands on SoAmpli straight away, and it will be great to feed off this momentum. Edwin wanted to hit the ground running with SoAmpli and there has been a lot of buzz. There was actually so much buzz in sales, that other departments are now coming to me asking to use the tool which is amazing. 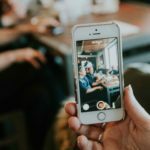 People who aren’t so familiar with social media have such a huge fear about posting things, but from a business perspective, social media is such an important part of your business persona. I now have the ability to provide content and reassure people they can post regularly with no fear. We now have people on social that never would have been on it before. I like watching everyone to see who’s sharing the most, which then helps me figure out who the big advocates are. Another benefit for me is brand awareness, in the past months we’ve gone through a huge rebrand. We want to push this out to the sales guys’ connections so they can get the brand out there more. The great thing is that people are friends with different people in their networks so there is a huge audience we can tap into. Charlotte: How do you currently measure your social media ROI? Louisa: Prior to SoAmpli, the way we measured our results on social media was all qualitative. We would use HubSpot for social publishing and to keep track of followers and check in to see who’s tweeting at us. The biggest gap with HubSpot is that we didn’t have a formal way of how they were measuring things, which was a massive part of reaching out to SoAmpli. Now when we give dashboard stats from SoAmpli that’s really helpful. Charlotte: Can you walk us through your SoAmpli routine? The great thing about SoAmpli is that a lot of my co-workers are also putting content into the platform, and I have full control over what is approved and what needs editing. Louisa: I have the app on my phone and I am constantly checking in on who’s posting. SoAmpli is always open on my desktop. I run social media so I am looking through the news all day. Before SoAmpli I would keep a list of articles, and now it is just a matter of copy and pasting the link into SoAmpli, like a content library. We are working with a PR company at the moment, who send posts to us each week. Whenever I get the email I block out 30 mins of time to put posts into SoAmpli. There are new posts going into SoAmpli every day. The great thing about SoAmpli is that a lot of my co-workers are also putting content into the platform, and I have full control over what is approved and what needs editing. If I don’t approve their post after 3 hours I start to get emails asking what the turnaround is, as they are so keen to share the content. Sometimes people will have great articles but they don’t know what to say in the post. So I’ve encouraged everyone to copy and paste the article, and I will create the message for them so they don’t need to worry. It takes about 30 mins to approve and edit things each day. Our social media sharing is definitely more efficient – in Hubspot you couldn’t draft things before, so I really like that you can draft the post in SoAmpli. I really like the internal likes and comments as well. It is almost like an internal communication system for us, no more constant emails and phone calls. SoAmpli has really saved me time for internal communication as I don’t have to email people anymore to share tweets. Now people just get notifications from SoAmpli. Charlotte: What’s your favourite SoAmpli feature? Overall choosing to go with SoAmpli has been one of the best decisions ever, and the buzz within Duck Creek has been crazy! Louisa: Scheduling posts is definitely a favourite feature. Channels as well as it’s a great way to group content. I’m starting to encourage the team to be more strategic about what they’re sharing, helping to guide them with what content they share. At the moment Duck Creek are building up a recruitment team, and they don’t really have people to build content, so they come to marketing. This would take up too much time originally but now what’s helpful is that they can go into SoAmpli, create posts, and marketing can review and edit them. I can support the team without having to build the content. This is a really big thing for me. Overall choosing to go with SoAmpli has been one of the best decisions ever, and the buzz within Duck Creek has been crazy! The sales team are so bought into the platform and that’s really cool, we would definitely consider adopting it across the organization because of this. On top of all of this, the team at SoAmpli have been so responsive and so easy to work with. With other suppliers, I might be worried about getting hold of them, but with SoAmpli I never worry. You guys are a real partner, that’s what’s cool, you’re not a vendor you’re a partner. I can’t wait to see what the future holds for this exciting partnership between Duck Creek and SoAmpli.